Bloom vs OptinMonster: Which is the Better Optin Plugin? When it comes to feature-packed WordPress plugins for displaying email optin forms on your site, there are two frontrunners: The ever-popular OptinMonster and the more recently released Bloom, from Elegant Themes. As regular readers will know, we’ve already looked at these plugins in detail in two previous posts: OptinMonster Review: Exploring the New Features of this Optin Form Plugin for WordPress and our more recent Bloom Review: A Brand New Email-Optin Form Plugin from Elegant Themes. However, while those reviews go into considerable depth, they don’t try to help you answer the all-important question: Which is the better option for your site? To help you decide, let’s compare the two. We’ll look at their features, assess how easy they are to use, and try to determine which offers the best value for money. Let’s get started. The most important features of an email optin plugin are the form types on offer. 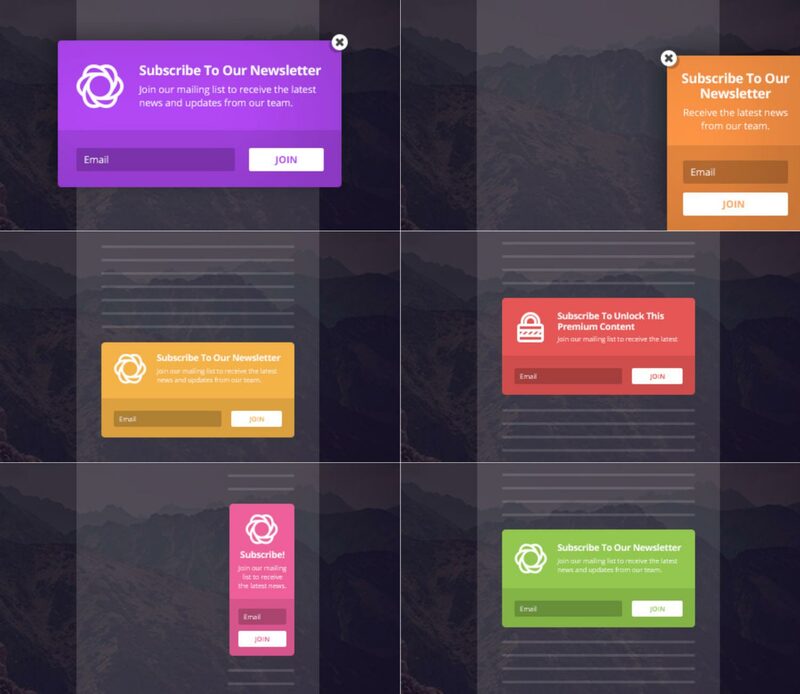 Both Bloom and OptinMonster go far beyond being just popup/optin form plugins, and both include useful form types that will help you grow your email list. 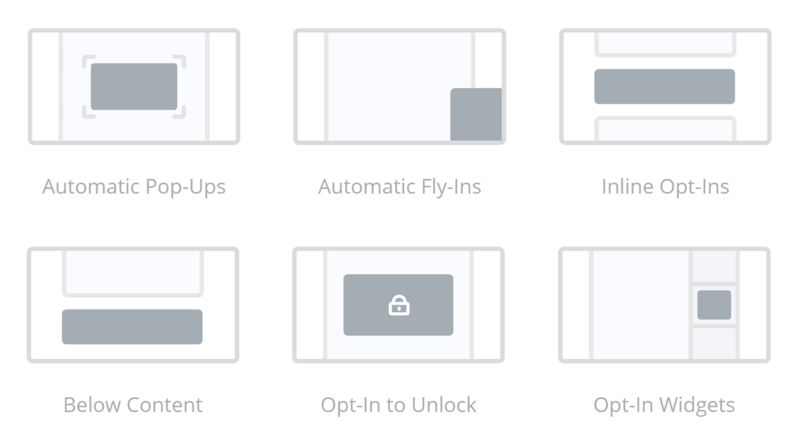 Bloom lists six form types: Lightbox popup, fly-in/slide-in, widget, below post, in-content shortcodes, and locked content. Bloom gives you six optin types to choose from. 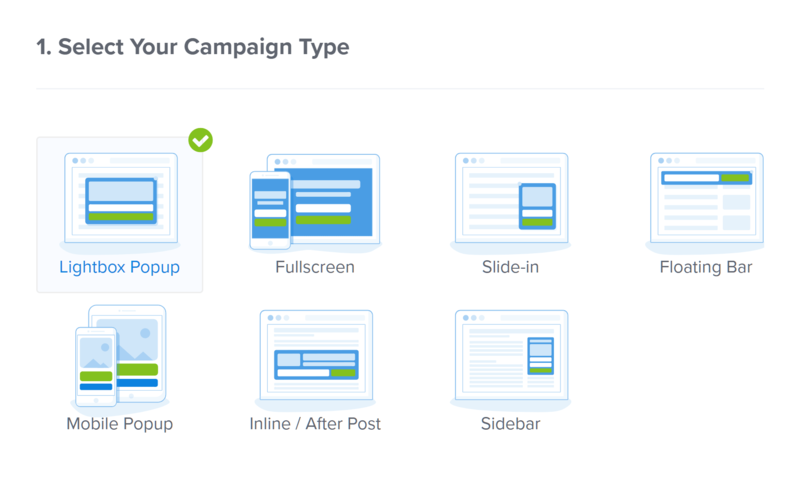 With OptinMonster, you get access to seven optin/popup types: Lightbox popup, fullscreen welcome mat-style, slide-in, floating bar, mobile popup, inline/after post, and sidebar. There’s also a blank canvas popup option that can be used to display any custom content of your choice. However, like many other aspects of this plugin, the exact form and popup types you get access to will depend on which pricing plan you choose (more on those later). 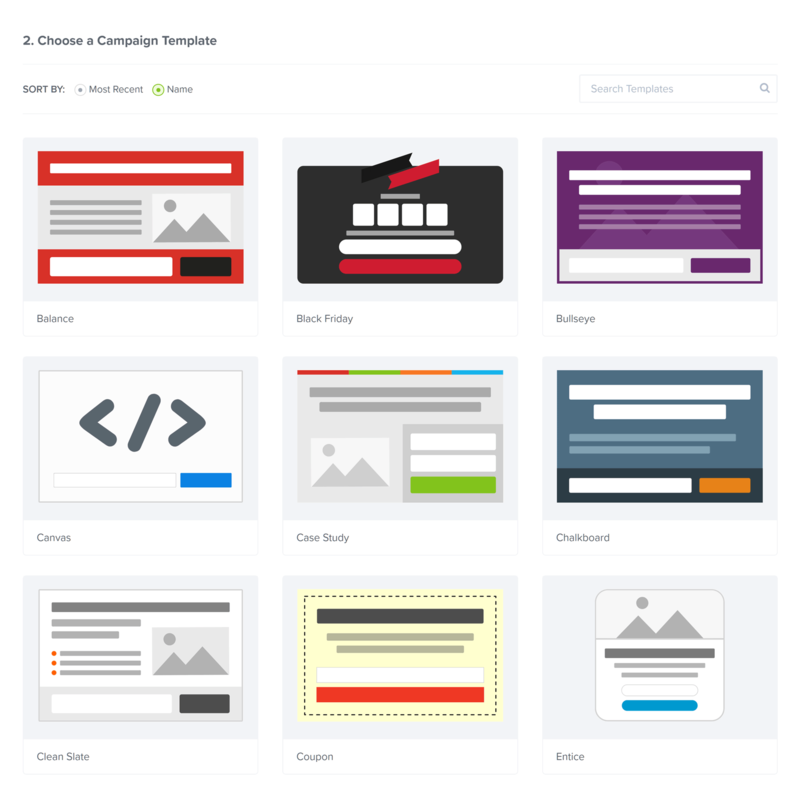 OptinMonster has seven main optin types, plus a blank canvas option. Bloom definitely covers all of the essential form types, but so does OptinMonster — and it also gives you a floating bar, a blank canvas popup, a fullscreen takeover option, and a mobile-only popup form. The locked content form option of both plugins would be useful if you wanted to use high-value content — such as a file download — to entice visitors to join your list. What’s more, being able to insert forms into your content using a shortcode could also provide you with an opportunity to get reader sign-ups midway through a post or page. With OptinMonster, the canvas form allows you to display any custom content you like within the popup window. This content could be product links, social media profiles, and shareable links, or anything appropriate to your content. In short: The endless possibilities presented by the canvas form make it a very interesting feature. Unlike Bloom, OptinMonster has a floating bar popup optin option. 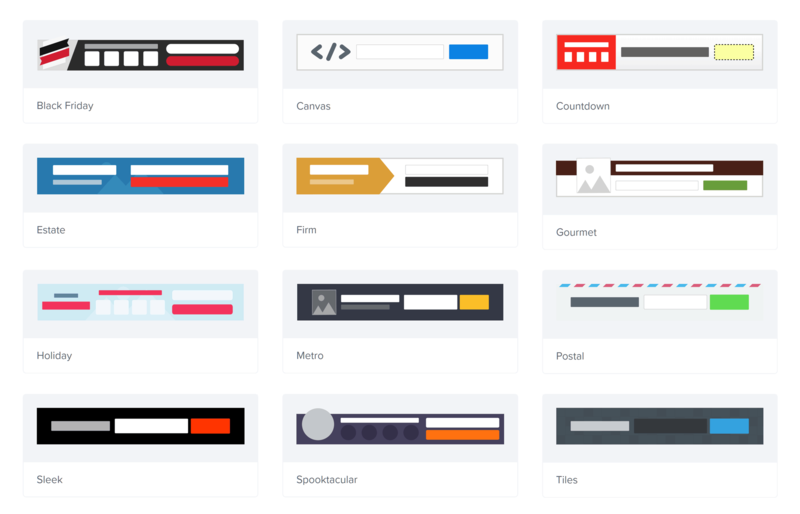 The OptinMonster floating bar is another potentially handy form type. This is because the optin form is always on display — either at the top or bottom of the window — wherever your visitors are on your page. In addition, if a sizeable number of your visitors are accessing your site on mobile devices, then the mobile-only popup of OptinMonster will definitely be appealing. However, with Bloom, you can set an optin to not display on mobile devices. OptinMonster’s recently added fullscreen takeover form is also a winner. When displayed, this option covers the whole browser window, and can be launched when a visitor arrives on your site or is about to leave. 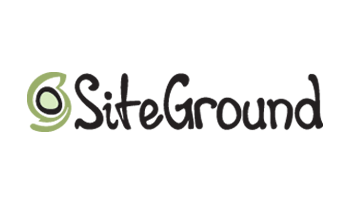 If you really want to grab the attention of your visitors, this could well be the best option. Both plugins also give you a selection of animation effects to apply to your forms to catch the attention of your readers. While OptinMonster has more animation effects, the difference between the two isn’t that substantial. However, a recent update to OptinMonster lets you add sounds to your popups as they’re displayed. Verdict: OptinMonster wins on this point because it has more form types. This includes some useful options (such as the canvas popup) that just aren’t available with Bloom. The catch is that it requires a paid upgrade to get these additional form types. Bloom ships with an impressive number of prebuilt form templates that can be applied to all of the form types on offer. On closer inspection, though, many of these form templates are actually only slight variations on the core set of designs. Despite that, there are still a good number of significantly different designs on offer. Just some of the customizable Bloom optin form templates. The OptinMonster form templates are divided across the different available form types. Because of this, some form types have more templates than others — but, whichever form type you do choose, you won’t be short of template options. Each OptinMonster form type has its own set of purpose-built templates to choose from. Overall, both OptinMonster and Bloom have a similar number of form templates. However, with OptinMonster, you get access to a more varied selection of designs than you do with Bloom. It’s also worth pointing out that both plugins allow you to customize the templates in great detail. 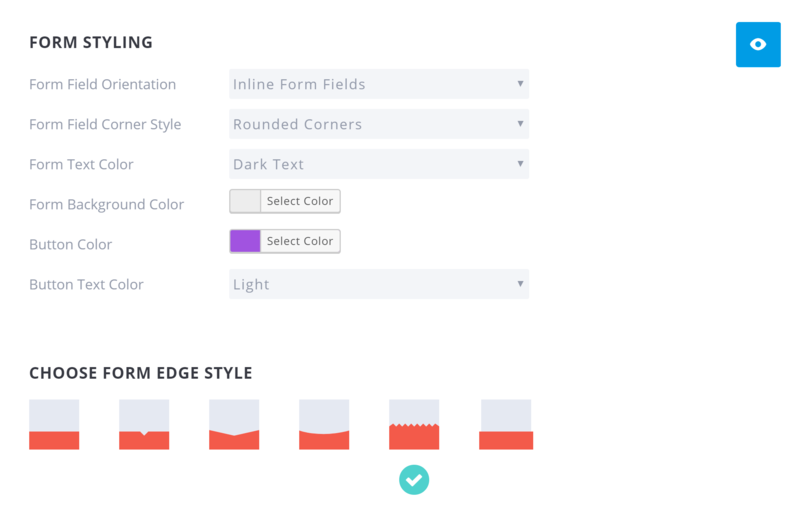 Bloom gives you a vast array of settings to work with when customizing your form design, but OptinMonster makes it particularly easy to customize the forms, thanks to its user-friendly interface. Verdict: Comparing the quality and variety of the designs is a tough call. Bloom does make your life easier by including multiple prebuilt variations on each of the core form designs, while OptinMonster has a broader selection of distinctly different designs from which to choose. Neither plugins are lacking in this area, and your personal preferences will dictate which template designs you prefer. Triggers let you control when your forms are displayed, so your readers have enough time to form an opinion of your website and its content first. The delay to trigger your form could simply be time-based, or it could be more complicated, such as employing a mechanism that triggers your form when a visitor scrolls to a certain point on the page, or when they’ve reached the end of a post — or even when they’ve been inactive for a set amount of time. Bloom has some great triggers that control when your forms are displayed. 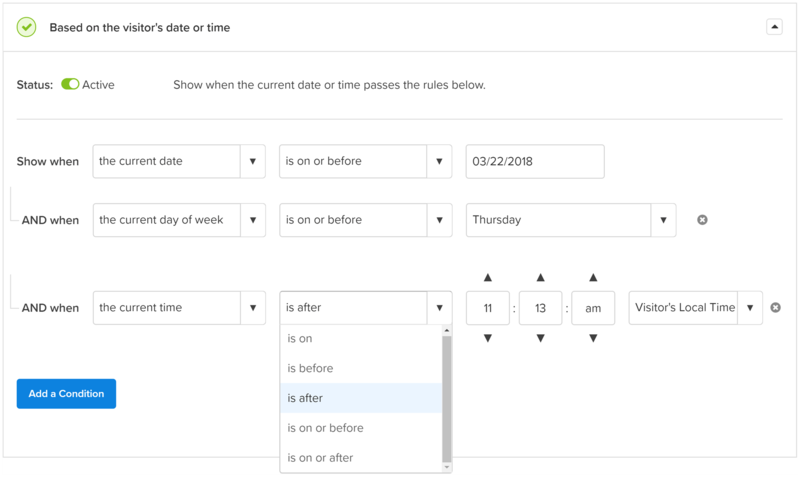 With Bloom, you get access to some very interesting triggers, such as time delays, after commenting, after a WooCommerce purchase has been made, page scrolling triggers, idle time triggers, and when a user clicks on a button or link. OptinMonster now has a bigger selection of display rules than Bloom, although neither plugin is lacking in options. Updates to OptinMonster have seen more displays added, including a powerful time and date-based option that’s great for displaying promotions on certain days of the week or during a specific time period. 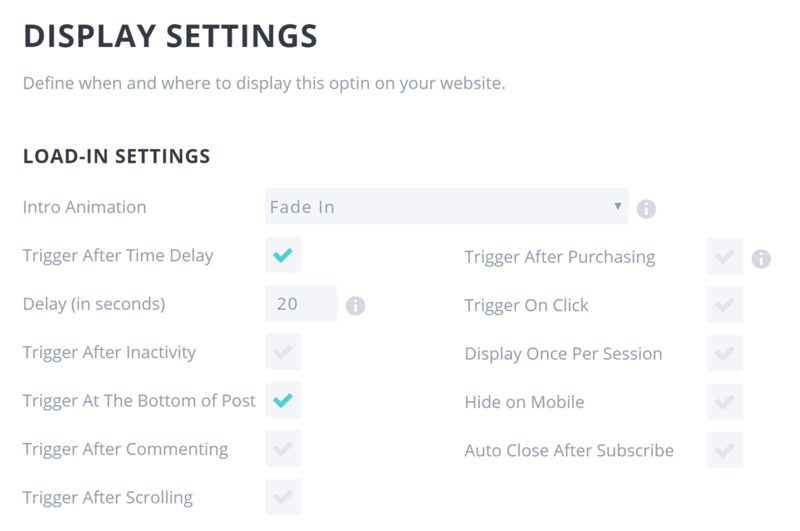 Like Bloom, OptinMonster also has a scrolling-based trigger, a timed trigger, an inactivity option, and a feature that lets you add links to your content that trigger a popup when clicked. OptinMonster supports multiple time and date-based conditions to control the visibility of your popups and optins. The main difference between OptinMonster and Bloom in this area is that OptinMonster has an exit intent trigger. The exit intent trigger can detect when a visitor is about to leave your site. This is done by tracking the mouse cursor movement to detect when it leaves the browser window, giving a good indication that the visitor is about to click the back or exit button. As the cursor leaves the window, the form is displayed. The benefit of this is that your popup form is only displayed when a visitor is about to leave your site, thereby removing the risk of annoying readers as they’re consuming your content. Verdict: While the triggers of Bloom are very useful, OptinMonster wins here, thanks to the inclusion of an exit intent trigger. Both Bloom and OptinMonster give you lots of control over where the forms are displayed — whether across the entire site, on posts from individual categories and tags, or on specific pages. 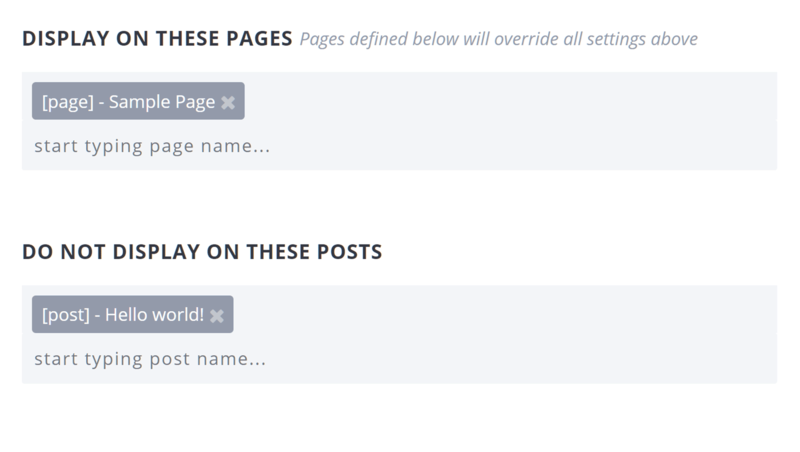 Both also allow you to exclude individual posts and pages from featuring the forms. Bloom makes it easy to define the content where your optins will be displayed. While both plugins have good display settings, OptinMonster takes things to the next level with controls that cover the visitor’s physical location, visitors with a specific URL parameter, visitors using Adblock, and visitors from a specific traffic source. 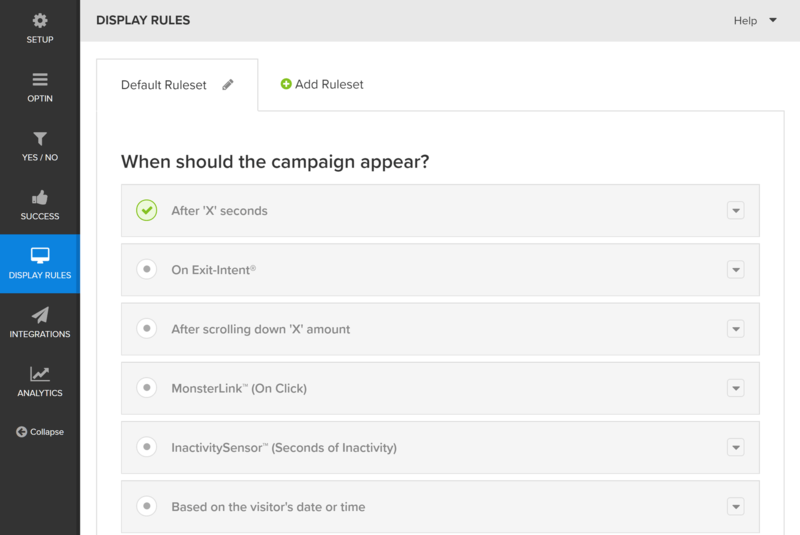 OptinMonster has impressive control for defining who will see your forms and popups. As well as displaying a custom message, both OptinMonster and Bloom let you redirect visitors to a specific URL after a form submission. 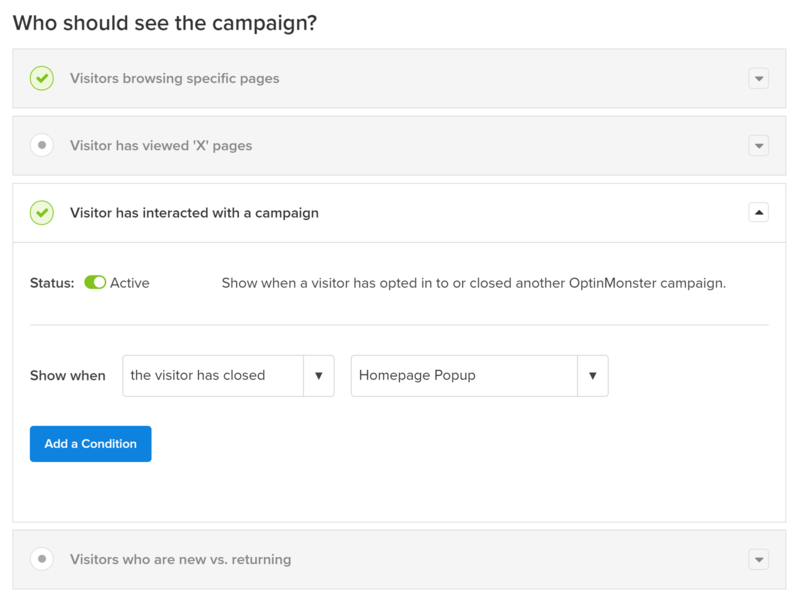 OptinMonster makes it possible to combine multiple popups, and trigger them based on how the user has interacted with them. Verdict: OptinMonster wins this one, as it has more options for hiding and showing your forms based on more scenarios. Both plugins integrate with all of the leading email marketing services, and the process for connecting the plugin to your email list management service is equally straightforward with both options. Be that as it may, OptinMonster has the edge, as it supports a wider range of services. However, Bloom has been adding support for more services with each update, so may well catch up soon.  Bloom now integrates with 16 email marketing services but OptinMonster works with more. Verdict: OptinMonster wins based on the larger number of email marketing services currently supported. Creating, configuring, and managing your email optin forms is actually very straightforward with both plugins. Bloom has a slightly outdated form designer interface, but it’s still possible to customize your optin designs. Bloom uses a custom-designed back-end control panel that’s accessed through your WordPress admin area, while, thanks to a recent update, OptinMonster is now a hosted service. 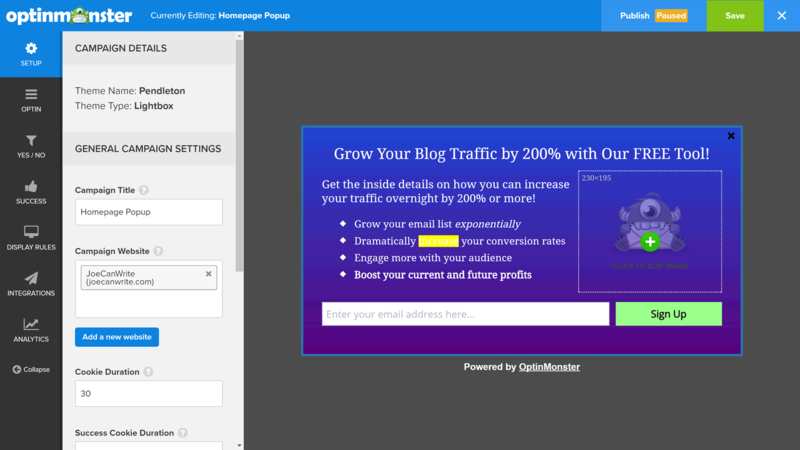 OptinMonster now has an intuitive front-end popup designer interface. OptinMonster’s move to a hosted service does mean creating and managing your OptinMonster forms takes places outside your WordPress dashboard, but the user interface should be familiar to just about all WordPress users. Moving to a hosted service has its pros and cons, though. On one hand, it means you have an extra site to log in to to manage your forms; on the other hand, you can now manage forms for multiple websites through a central dashboard. It also allows you to use OptinMonster on any website, not just those powered by WordPress. While each user interface is different, they both work very well. However, OptinMonster — featuring a side panel of settings next to a large main panel with a live preview of your form design — makes it easier and faster to build your forms. The fact that OptinMonster is now hosted outside of your WordPress website, however, may put you off if you prefer working directly in your WordPress dashboard. Verdict: OptinMonster wins here, thanks to a user-friendly interface with a large live preview and click-to-edit customization options. Both plugins are packed with useful features, but there are a few points of difference. Both Bloom and OptinMonster have a large number of form templates, and the level at which these can be customized is very impressive — although OptinMonster has a more varied selection of templates than Bloom. When it comes to form and popup types, OptinMonster has floating bar, blank canvas, and fullscreen welcome mat-style optins that are missing from Bloom. While Bloom doesn’t have the exit intent trigger either, the scrolling and time-based triggers are good compromises. It’s fair to say that both plugins cover the essentials when it comes to form and popup types. There are a few other areas where OptinMonster offers more than Bloom, such as the form designer interface, which gives a live preview of your work. The canvas form that allows you to add any content to your popup (instead of an optin form) is also a useful tool to have access to — not to mention the fullscreen takeover option. The exit intent form display trigger also can’t be overlooked. Although different, neither plugin is lacking in features, which means deciding which one has the best feature set for your own project depends on how much you value exit intent and canvas popups, as well as how much control you need over who can see your popups and optins. 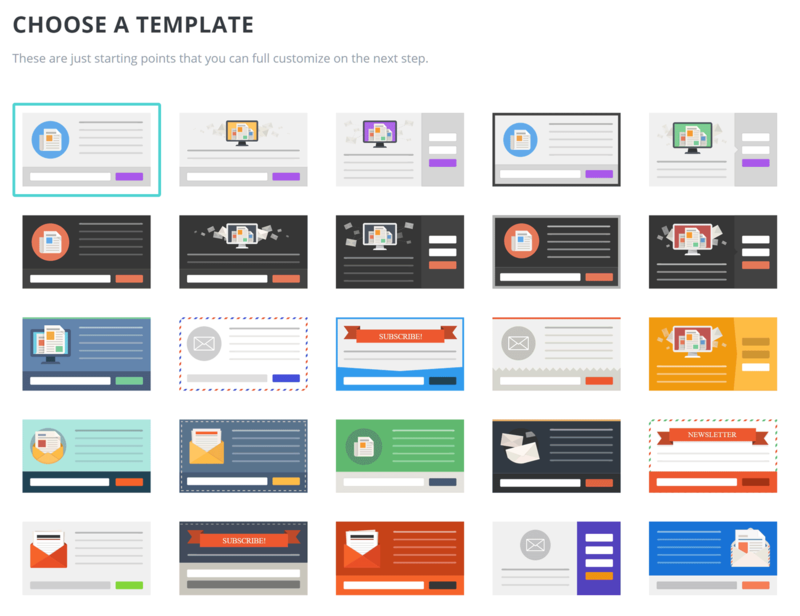 Additionally, the set of form template designs you prefer will also help you to decide which plugin to go for. Verdict: Both plugins cover all of the essential features, while offering their own way of doing things. On paper, though, OptinMonster has more features than Bloom. 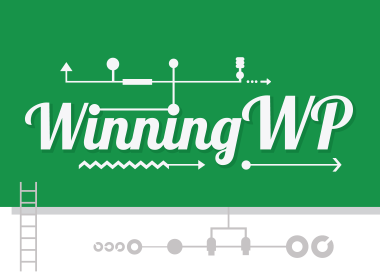 But, when it comes to declaring a winner, it’s going to come down to your personal preferences and requirements, and which plugin most closely meets your needs. Bloom is available on two price points: An annual license and a lifetime option. With both, you get access to all of the features, and use on unlimited websites. OptinMonster, on the other hand, is available on four pricing plans. These are based on the number of sites the plugin can be used on, and which features you want access to. This makes it difficult to compare Bloom and OptinMonster on value for money — and the fact that the price of Bloom also includes access to all of the other plugins and themes available from Elegant Themes makes it even tougher still to make a direct comparison. The best value option will depend largely on which features you need to access, as well as the number of sites on which you plan to use the plugin. OptinMonster is available from $108 a year. If, however, you want access to all of the features, you could end up paying as much as $2,388 a year — the equivalent of $199 a month — for the Agency package. Basic: $9 per month — use on one site with limited form types. Plus: $19 per month — use on three sites with additional form types (floating bar, sidebar, content locking, and so on). 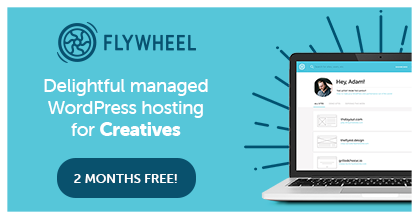 Pro: $29 per month — use on unlimited sites, plus more form types (including exit intent and canvas), and extra features (including referral detection and scheduling). 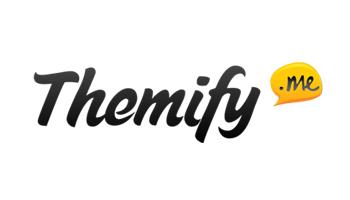 Agency: $199 per month — use on unlimited sites and all features (including custom branding, onsite retargeting, and geo-location targeting). All OptinMonster plans are billed annually, and you can view the full details including exactly which features you get access to here. Bloom is priced at $89 for one year or $249 for lifetime access to support and updates, with both options covering unlimited website usage. 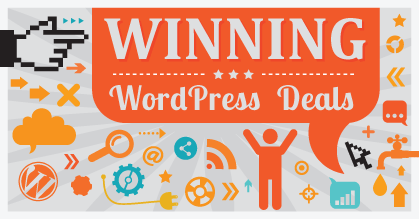 The price of Bloom also gives you access to all of the other WordPress themes and plugins from Elegant Themes, which includes its flagship Divi WordPress Theme, the ever-popular Monarch Social Sharing Plugin and the standalone Divi Page Builder plugin. While you do have to pay extra to get access to the exit intent, canvas, and other advanced features of OptinMonster, none of those are available in Bloom at any price. In terms of cost, Bloom’s $89 price tag sits between the Basic and Plus OptinMonster plans, which have limited features compared with the Pro and Agency plans. Verdict: When comparing value for money, I’d say Bloom is the better option, because it has a lower price that still includes a good set of features. While OptinMonster has won the most rounds, there isn’t much to separate these two plugins when it comes to the essentials. Both are very easy to use and include all of the features you’ll need to start growing your email list. However, when it comes to advanced features that can really boost your results, OptinMonster comes out ahead — although access to those extras isn’t cheap. If budget is a key factor, investing in Bloom is probably the best option, compared with the entry-level $108-per-year OptinMonster package. If you’re in the market for one or more new WordPress themes, joining the Elegant Themes club represents great value for money (it offers access to all 87 themes and plugins for $89). 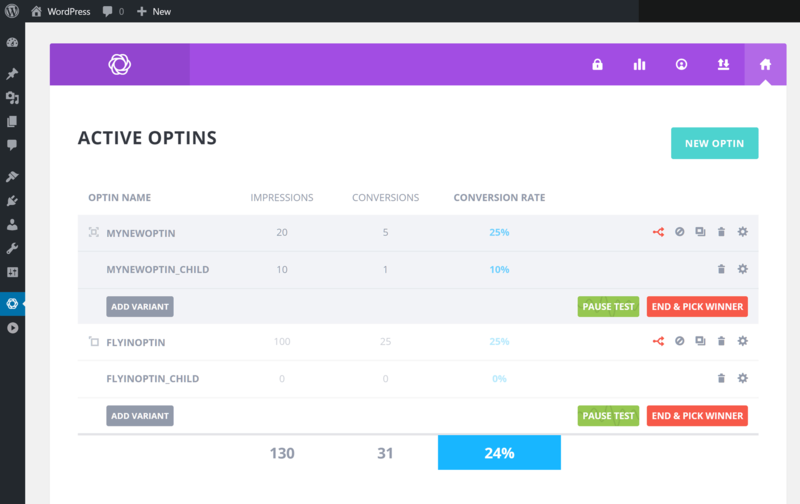 On the other hand, if you can afford the highly specced Pro and Agency plans from OptinMonster, you’ll end up with access to a powerful tool for increasing conversions on multiple websites. 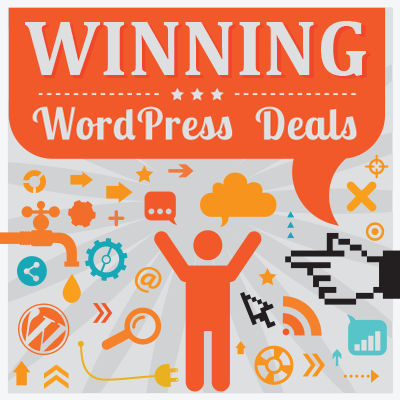 At the end of the day, the features you value the most and how much you’re willing to spend will determine which is the best WordPress optin form plugin for your website. When it comes to deciding between Bloom and OptinMonster, it’s really all up to you to make the final call. Using either Bloom or OptinMonster? Thoughts? I already have a theme! Elegant Theme’s pricing model is stupid otherwise I would have bought their plugin. I’m with you. Have no idea how they make that business model work. Me too. It makes no sense to bundle stuff like this without offering a standalone product. It maddens me even more that this is on a subscription, rather than a one-time purchase. I actually purchased their bundle for my wife’s website, but the themes are very low quality and the other plugins are just ok. I requested a refund within days. Bloom is their only great product. Maybe it’s just me, but I don’t see getting a bunch if extra (low-quality) themes and plug-ins for “free” as a perk. It just cheapens the whole deal. I think the $249 Lifetime License is good value for what you get — all the themes, use on unlimited websites… this is good value for Divi alone, but you get access to Bloom too. I’ve really looked at the other themes yet. As for Bloom, there’s no double opt-in option. Let’s say I want to trigger a pop-up on a link or image. I can’t do that in Bloom. Yes you can. There is a click trigger option. With a fairly hefty monthly fee, I expect better support. They only do it by EMAIL on OptinMonster. I’ve had a problem integrating and have been at it for six hours now. They keep telling me I didn’t add the API key, but I DID. Then they just refer me to their useless tutorials. I went through them already and I did input the API correctly, So now I have paid for something that doesn’t work MARVELOUS.